In the 1970s, Latin American countries were forerunners in the use of future-oriented methodologies, mainly simulation models and scenarios for improving policies in the area of science and technology. The simulation models, such as the Latin American World Model, focused in the social and political problems and tried to present an image of the ideal society. This was a response to the Club of Rome’s Limits to growth model, which focused on the physical constraints. The first prospective studies were intended to understand and predict the structure of the world, as well as to support an alternative vision of the international distribution of power and wealth. For this to materialize, it would have required the capacity to introduce major changes in the economic and political international order. This utopian condition affected the predictive power of the models by depriving them of an objective point of view. As the development model followed by Latin American countries during the 1970s began to fail and the world economy entered a period of transformation, the wishful thinking that had inspired these models became increasingly obvious. Information systems and access to databases: ensuring the continuity, standardization, access to bibliometry and patent databases. Links among heterogeneous actors: networking between academic groups, stakeholders, businesses and government. In Chile, the organisational form of foresight has been mainly either one off-projects or national foresight program (figure 2). The Chilean Technology Programme was launched in 2001 and has produced studies on the future of ICT applied to education, biotechnology, Chilean software industry, wine production, aquaculture and food industry. In 2006 it launched its first regional study: “Economic activities contributing to the development of the Maule Region in the next 10 years”. The studies follow a roughly similar design: desk research for the diagnosis phase; brainstorming sessions to identify topics and key issues; workshops with targeted experts to discuss the Delphi design; and an online Delphi to gather views and opinions about the future. 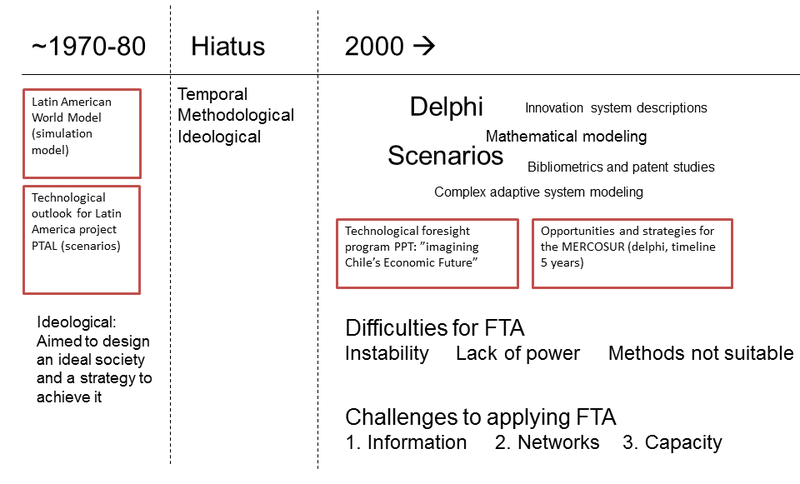 Regarding the Chilean experience on Foresight models, what can we tell so far comparing what was envisioned, and a proper and objective assesment 10 years later?